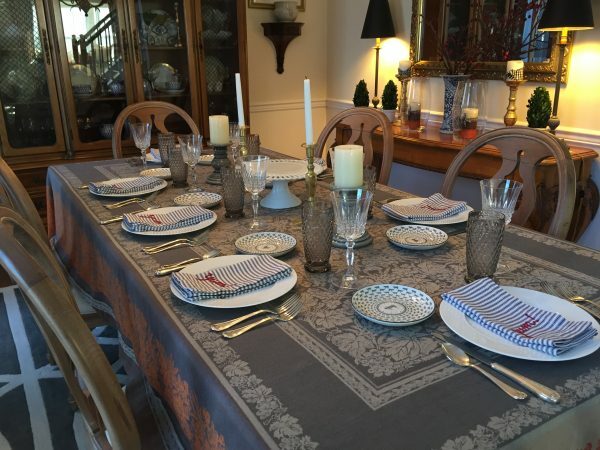 Holiday Hosting can be as easy as an impromptu get together or as involved as a dinner. Either way, there is a degree of planning that takes place. Regardless of how you choose to entertain, anticipating those needs will inevitably make the party more fun for you! And although there is a lot to coordinate, today we’re just looking at what goes into one inviting grey & white tablescape. Tablescape by Nancy @ Intentional Designs, Inc.
Dishes. My favorite is having a good set of white dishes. That being said, beginning with a set of white dishes allows any color combination to evolve. Above I added The Farmhouse Collection small plates from our Home Decor Shop. Vintage Stemware and smoke grey water glasses. 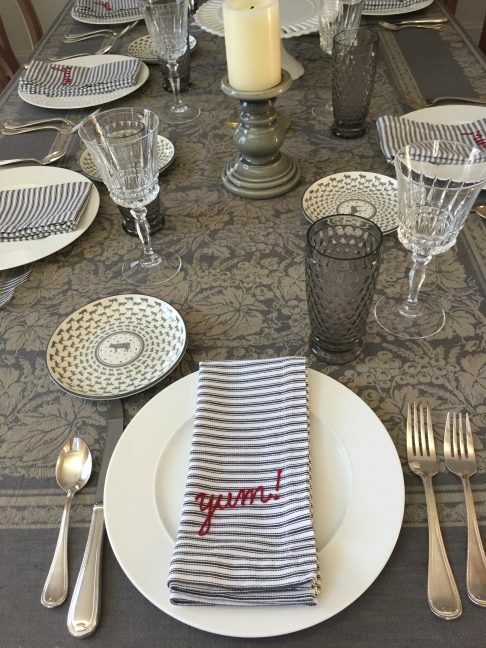 Fun napkins and a grey patterned tablecloth. Equally as important is a centerpiece. Although a “centerpiece” sounds stuffy it doesn’t have to be. Most often I like to use the dessert as the centerpiece, especially if a guest is bringing dessert. Because we all “eat with our eyes” as is said, this Marble and Glass Cake Dome looks super inviting! Finally, add some great candles. As in the featured table setting, I added a pair of our Grey Crackle Pillar Candle Holders. 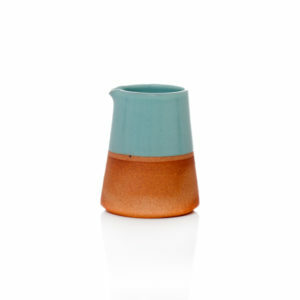 These pillar candle holders are pretty versatile. And, for this table setting the color, height and size worked perfectly.